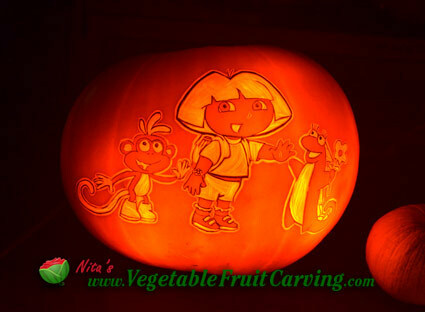 Both kids and adults will be amazed at these spectacular pumpkin carvings of cartoon characters. Disney favorites, such as Goofy and the Little Mermaid, as well as Looney Toons, Dora the Explorer, SpongeBob and more, grace the front of these pumpkin carvings by the the brothers and community members or Self Realization Fellowship and Encinitas residents in Encinitas, California. Each Halloween, the SRF carve pumpkins in a variety of themes to display at the annual Encinitas holiday event. Here’s a look at their incredible pumpkin carvings of cartoon characters. 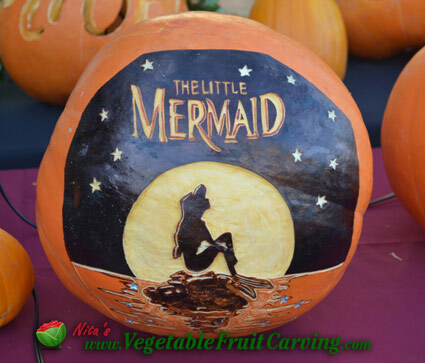 The Little Mermaid is a wonderful example of pumpkin carvings of cartoon characters. 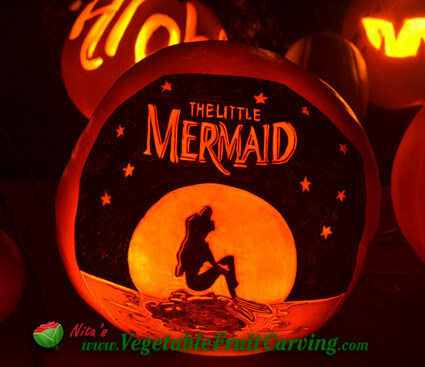 The way that the pumpkin glows from within captures the beauty of the Little Mermaid. 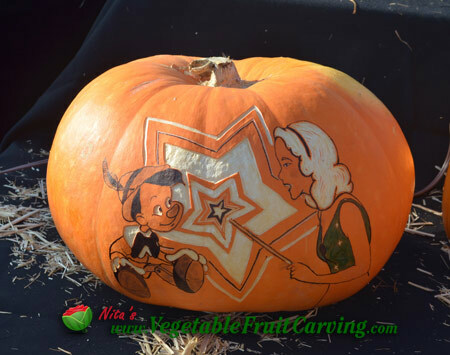 Pinocchio and the Blue Fairy make a lovely design on this pumpkin carving. 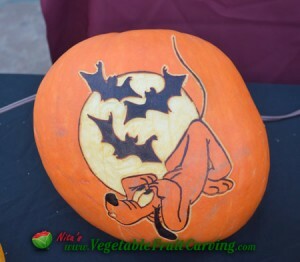 Pumpkin carvings of cartoon characters, like this Pluto carving, are a fun, festive way to celebrate Halloween. 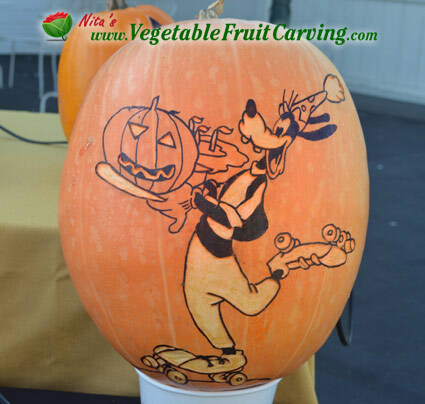 Goofy captures the perfect balance between fun and festive on this version of pumpkin carvings of cartoon characters. 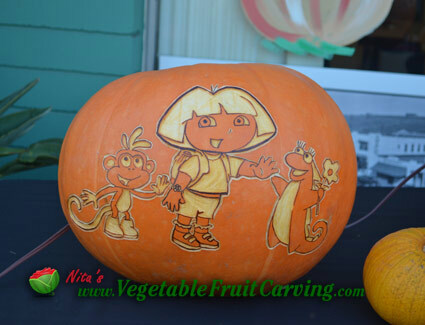 Dora brought along a couple of her friends on this pumpkin carving. Look at how beautifully Dora glows when the pumpkin is lit. 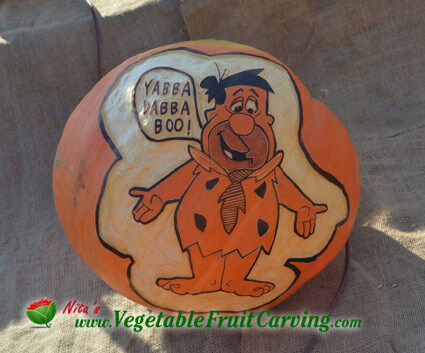 Fred Flintstone swtiches up his infamous “Yabba Dabba Doo” line to reflect the Halloween season. 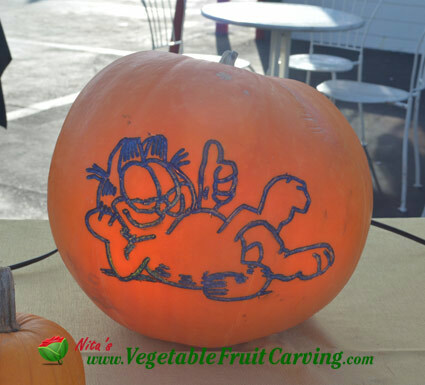 Garfield doesn’t mind being an example of the best pumpkin carvings of cartoon characters. 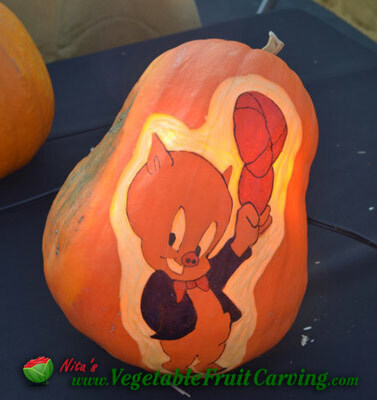 Porky Pig tips his hat to Halloween and being featured as a pumpkin carving. 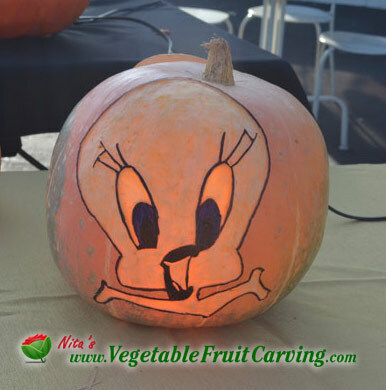 Tweety can hardly contain his excitement at being one of the pumpkin carvings of cartoon characters. 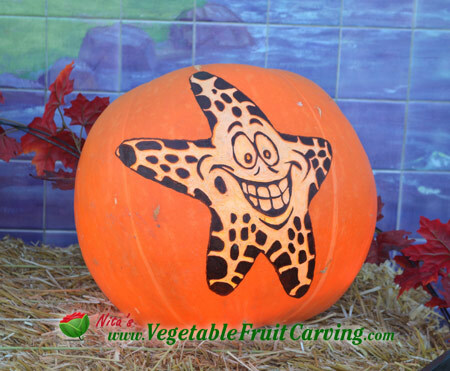 This is one happy cartoon starfish pumpkin carving. 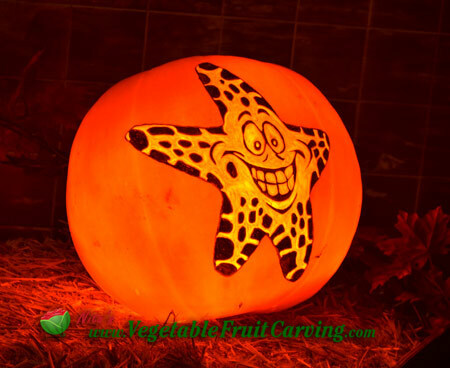 The happy starfish cartoon pumpkin lit at night is a beautiful sight. 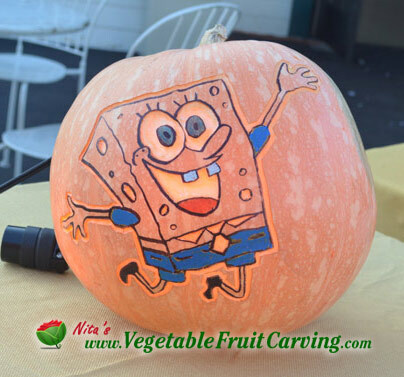 Spongebob jumps for joy as one of the pumpkin carvings of cartoon characters. 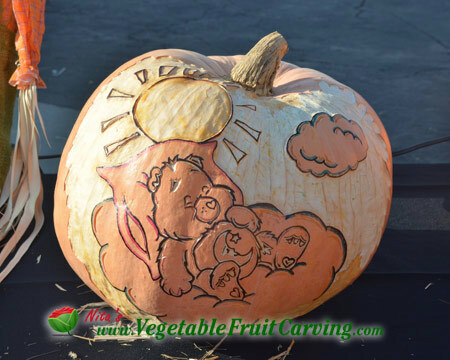 This Carebear is enjoying a nice afternoon nap on his pumpkin. 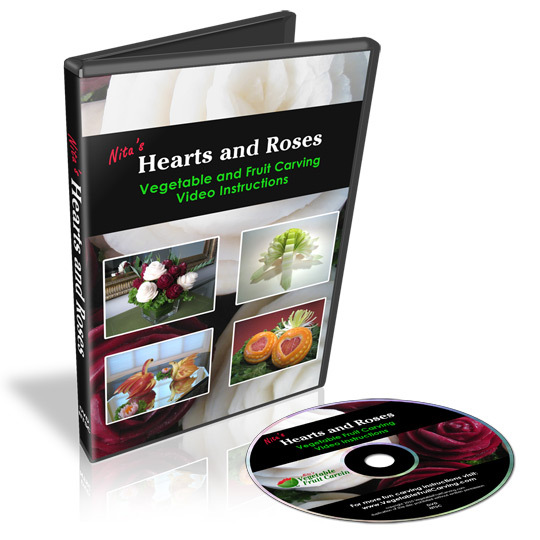 To view a short video showing how to make varying shades of light and dark on your pumpkins, click here. 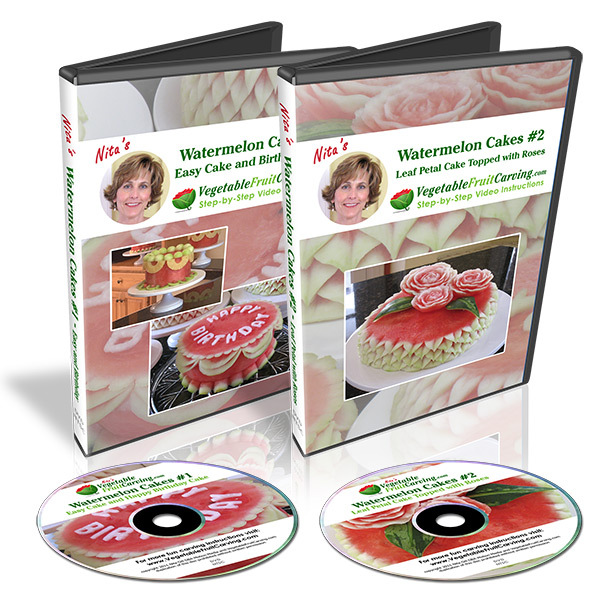 To learn how you can carve pumpkin portraits, click here. 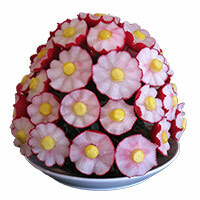 To see a lot more various carving designs, see the links near the top of this page. With so many wonderful pumpkin carvings of cartoon characters, it’s hard to decide on a favorite!